As a specialty manufacturer of industrial scales that also provides installation and service of their equipment, it was imperative that Cazbah develop a content rich website to meet their unique needs. The website was designed to provide the company’s prospective customers with not only the information on industrial scales that they were searching for but, everything that the customer needed to know about their scale solution and installation. Each page on the Holtgreven Scale & Electronics Corp. website was optimized to allow for the best possible search engine optimization. Potential customers find exactly what they are looking for when they go searching for an industrial scale solution. The optimization on the website ensures that searchers are taken directly to the appropriate page containing the information they need to take the next step in their buying decision. 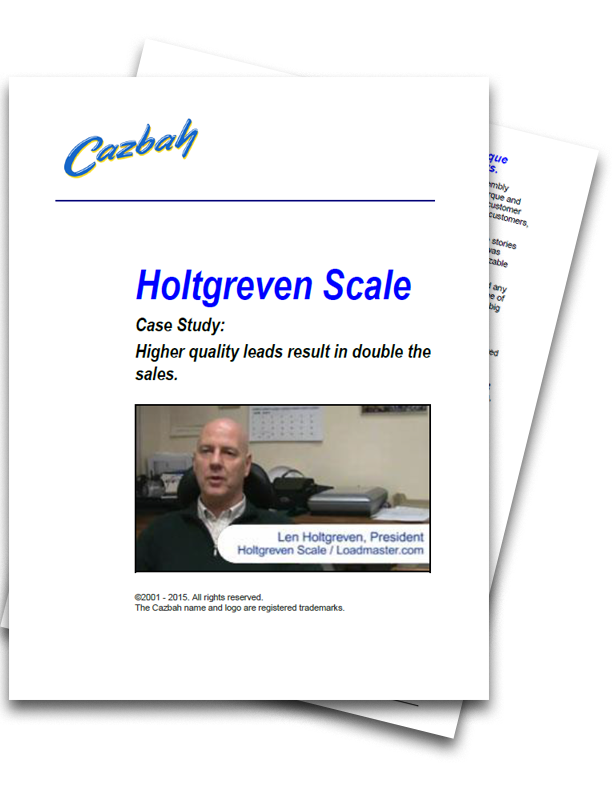 Being a business that relies exclusively on a quoting process for their sales, it was essential that the level of customer inquiry increased in all areas for Holtgreven. Len goes on to explain, “I’m averaging between 5 and 10 phone calls directly from our website per day. Email requests are the same.”.